Alan Farnham, senior editor of Forbes magazine, wrote a beautiful two and a half page feature on Relief Riders International in their lifestyle section of their July 24th issue. It's a inspiring account of both the riders' experience and the work we do on our relief rides. Click here to take our Multimedia Relief Riders Experience. We hope you enjoy it. Our fourth Rajasthan Relief Ride took place this February, and was highlighted by the launch of our extraordinary “Give the Gift of Sight” Program. If ever there was a clear indication of the growing success of our vision for Relief Riders, our new cataract eye surgery clinic is it. We are proud to say that in our first clinic in Mehansar our team, led by Dr. Gupta, screened 575 villagers and was able to provide life-changing surgery for 87 eligible patients. The success of this first eye surgery camp provides us with the inspiration to continue and build on this work for our future rides. 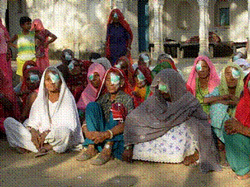 And we have decided to try and more than double our eye surgery camps in the 2006-2007 ride seasons. We have begun a fund-raising campaign to pay for 600 eye surgeries over the course of our 2006/2007 Relief Ride season. What is truly amazing about this surgery is how affordable it is to give the gift of sight. The $65 fee for each eye surgery covers the cost for the actual procedure, as well as out-of-pocket expenses for transportation and lodging for our doctors, the camp preparation and operating theater sterilization, nursing staff and equipment necessary for post-operative patient recovery. We hope to take 30 riders with us this coming season and to raise an additional $39,000 to fund the eye surgery camps. You are one of 800 friends who receive our continuing updates. If each one of you would take the time to underwrite a single eye operation, we could easily meet our goal. To date we have been successful in raising $5,500 and need another $33,500 in order to reach this season's goals. I appreciate how many important choices we have to make. There are many worthy charities out there. But I know first hand that every dollar we get goes directly to making sure our person-to-person humanitarian mission transforms the lives of our friends in India. Many of our friends have asked if there was a way for us to provide a non-profit status for donations. In response to that request we’re pleased to announce that RRI has established a relationship with Documentary Educational Resource (DER.org), extending 501(c) (3) non-profit status to both our “Give the Gift of Sight and Give a Goat programs. 1. To make a tax deductible donation by credit card please call DER at 800-569-6621 and reference Relief Riders International’s “Give the Gift of Sight” program. They will handle your donation and provide you with the necessary tax documents. 2. To make a tax deducible donation by check, please make your check out to DER and mail it to Relief Riders International, 304 main St, Great Barrington, MA 01230. DER will process your donation and provide you with the necessary tax documents. Please check out the July 24th issue of Forbes Magazine. “Riding to the Rescue” is a great 2 ½ page article about the experiences of alumni riders and work that we do on our trips. Please share this article with your friends. It is clear how many people are taking notice of our unique mission.